This is an exspantion of a previous project. It will have mostly villians and main speakers throught out the story. 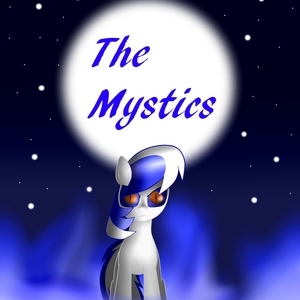 See my other project The Mystics for more details. The narrator must be able to read more then 5,000 word chapters. Smooth voice but dramatic when the time arises. The sun blazes over Ponyville. Ponies of all shapes and sizes talking and doing their daily chores as vendors sell their wares to passersby. While at the Sugar Cube Corner, fillies of all ages enjoy their sweets before heading to school. Silver Spoon and Diamond Tiara come out, giggling with a snobbish tone. The door closes with a jingle of its bell as they begin to trot over, rather slowly, to Ponyville High School. Silver Spoon steps forward and holds the door open for Diamond Tiara. Silver Spoon feels as though she needs to bow to Diamond Tiara as she trots in. When she takes a step forward, however, an orange blur flashes by her, making her spin on her hooves before falling onto her stomach. Description- Being a son of a royal guard, Flare is overconfident in his abilities and feels that every pony should follow and worship him. He can be easily angered and is ruthless. Feeling protected from his father's power. Flare bullies and pushes around everypony within PonyVille High School, however, when Fang arrives at the school and tears away Flare’s captain position in the Martial arts club. Flare makes him his rival and target. Pitiful! You can't even take this weakling? I guess i am going to have to do this myself! Description- Kodama is a very stuck up pony. He is overconfident, stubborn, and likes to take command of situations, but can be very patient when the situation arises. He is part of the Gorilla or Assault Unit of the Unicorn Triade. This unit is known to be ruthless and is mostly composed of bodyguards and strong fighters. Vocal Des- Medium but can be high when annoyed. Gridmire you dolt! Getting tracked so easily by these weaklings is just pitiful! Oh please! I can deafeat 100 ponies with one hoof tied behind my back. Description- Sand Stream is a very calm and solemn pony. He likes to sit and watch the stars at night while thinking back to his part, however, he is a part of the Unicorn Triades Scouting and Assassination Unit. They specialize in both silent and swift kills, while some of their forces are used for scanning with tracker spells to detect ponies or paths for the Triade to take/destroy. They also have the ability to travel quickly giving them the fastest speed of the Triad Groups. With this he has been known to be very cautious and judgmental of ponies around him. Voice Des- Medium and soft at points. I picked up two magical signatures behind this wall. Scratch that make it three. Description- Apple Bloom is a laid back and determined mare. She pushes herself to get stronger so she can achieve her goals as a martial artist. She loves going to practice working up her fore legs and back legs with sprints and boxing bags. She doesn’t like hurting anypony and if she does she can get very down on herself, However, when it comes to protecting other ponies from danger she is the first to step up no matter what needs to be done. I'm definitely going to be captain of the karate team this time! Flare better watch out! Description- Rumble is a kind soul who pushes himself in almost everything he does. He was recently appointed to the captain of his high school hoofball team and is always active, whether it be practice, workout or even just a day of running in the sun. He never likes sitting still for long periods of time and can be anxious when he is forced to. Hey Scootaloo! I was wondering if you wanted to get a shake later and catch up? Description- Flash Sentry is very laid back stallion that likes enjoying his day laying in the sunlight, however, his duties of being captain on the Crystal Guard, the Crystal Empire's branch of the Royal Guard, keeps his relaxation time very small. Before he enlisted into the Royal Guard he was a professional Hoof Boxer winning 10 straight championships within the Crystal Empire. Vocal Des- Medium and laid back voice. Ah come on Shining Armor. Why can't we just relax for today? Damn it Shining Armor! You said that they wouldn't be able to detect us with that Barrier of your's! Description- Gridmire is a rough and practically silent pony. He relies on his senses and gut feelings to keep him alive. He trusts no pony but himself and only listens to those he perceives as life threatening. He is a member of the Unicorn Triad and is a scout in the Assassination Unit within the Unicorn Triad. Haha! I knew you Royal Guard were strong but being able to defeat my best stallions is impressive. Description- Shining Armor is the most loyal of the Celestial Guard, Royal Guard branch under Celestia. He dreamt of being a captain of the Royal Guard, to protect ponies who couldn't protect themselves. So once his hard work and determination paid off he has been working to gain ponies respect and save/protect every pony he can. He is the husband of the Princess of Love, Cadence, and The Princess of Magic, Twilight Sparkle’s, Brother. Voice Des- Medium and Stern. * whispers* Flash get close to me! He's is using a Radar spell to look for us.